The first 15 minutes of Will Arbery’s Plano are experimental-theater perfection. They move like lightning. They’re hilarious. They look like one thing (three sisters chatting on a porch) but they are another (a reality-bending boot camp for the mind). If other parts of this high-weird comedy don’t have the same precision and surprise, it may be because the first moments have worked too well: Our thoughts have been accelerated to fruit-fly speeds, so the later sequences strike our newly superperceptive brains as a little slow. 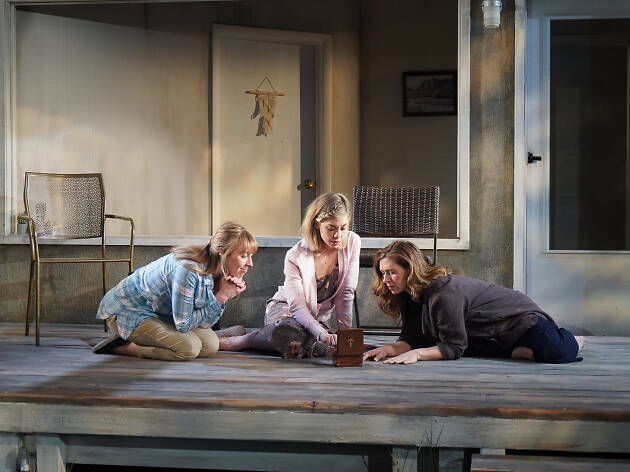 On a seemingly normal wooden porch in Texas, Anne (Crystal Finn) rattles through a conversation with bossy Genevieve (Miriam Silverman) and fragile Isabel (Susannah Flood). Anne is pregnant, and she’s telling her slightly shocked sisters about her new lover John. “Okay I’ll introduce him later. It’s later, here he is.” John (the superb Cesar J. Rosado) melts around the proscenium edge and is suddenly there. In Plano, time whips past us, like film on a reel that’s been cranked into high gear. John keeps slipping off—he has things to do in Plano, he says—and other men, even other Johns, multiply and buzz around the women. The three have their own eerie capacities, which emerge in a few witchy moments, but male menace challenges their power of three. Genevieve’s husband Steve (Ryan King) leaves her for someone younger, but versions of him are always still around, demanding attention and praise. A faceless boy tackles Isabel as she starts to have ecstatic visions; she complains her God has turned against her, but it’s just the devil next door. What the hell is going on? Arbery is playing with a sunny-Texas-weekend version of Lovecraftian horror—with men providing the terror instead of squid-aliens—while also writing a tightly observed portrait of sisters. Director Taylor Reynolds presides over a production that does Arbery proud: Daniel Zimmerman’s set looks normal, but the more you look at the simple wooden house in Isabella Byrd's slanting light, the more you mistrust its geometries. And in a stellar cast, Finn, Silverman and Flood prove to be masters. It’s delicious to see a playwright binding genres so confidently (body-double horror and rueful family comedy), but the real pleasure is in how much Plano manages to bend how you perceive reality beyond the proscenium. Heading out of the theater, I thought, “It’s later, I’m home,” expecting time to warp to my needs. And you know? It kind of worked. Connelly Theater (Off Broadway). By Will Arbery. Directed by Taylor Reynolds. With ensemble cast. Running time: 1hr 20mins. No intermission.